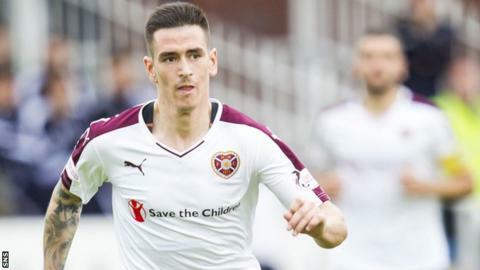 Hearts winger Jamie Walker has undergone a knee operation but is expected to return to action early in the new year. The 22-year-old has not played since a Scottish League Cup defeat by Celtic in October. Hearts head coach Robbie Neilson told BBC Scotland: "It is better news than we expected. "We were looking at six to eight weeks, but we are now looking at two to three weeks before we get him back fit." Scotland Under-21 international Walker, who earlier this month extended his contract until the summer of 2018, has scored twice in 13 appearances this season for the side sitting third-top of the Scottish Premiership. "We tried to rehab him and we just weren't getting to the bottom of it and we finally found out the issue," revealed Neilson. "He went down today and had a quick operation to take a wee bone out that's been floating about in his knee." Neilson was speaking after the 3-2 victory over Dundee United and he praised Gavin Reilly, who scored Hearts' first goal of the evening. It was only the second time the 22-year-old striker has found the net in 17 appearances, mainly from the bench, since his summer switch from Queen of the South. "Gav's a really good player and that was the reason we brought him here," said Neilson. "He's had to be patient. He's had to wait for his chance to come in and he's certainly taken it. "I thought against Celtic he played really well and tonight I thought his work rate and willingness to go in behind is really good. "When he first came here, he maybe thought he had to change his game because of the way we play. "But the reason we brought him was because of the way he plays and because he gives us something different and I think we're starting to see that now."